Pt. Vishnu Parshad Vassyal Pt. Vishnu Parshad Vassyal has worked as a Priest for five years at various Temples and religious institutions in India. Pt. 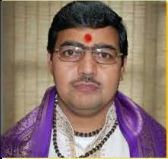 Vassyal obtained his Acharya degree from Sampoornananda Sanskrit University in Varanasi, India in 2002 and received a Shastri degree from the Sampoornananda Sanskrit University, Varanasi, India in 2000. He completed a Pujari Training course from Shree Bharti Rishikul Sanskrit Vidyalay, Bakoli, Delhi. 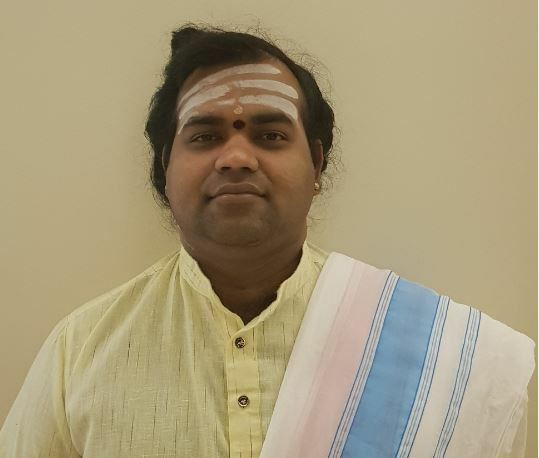 He has extensive experience in performing religious services, rituals, sacraments for the community, providing sermons on spiritual matters and religious aspects, arranging and organizing special ceremonies on various Hindu festivals and religious holidays. Pt. Vassyal has a thorough knowledge of the Bhagavad Gita, Ramayana, Vedas, Upanishads and other sacred texts and ancient Hindu scriptures. He has working knowledge of Hindu Vedic Astrology, Palmistry, Yoga-Asana, Meditation, Vipasana and traditional Hindu meditation forms. Shree Jayeshbhai Pandya Shree Jayeshbhai Pandya was born in the city of Dhandhuka, district of Ahemdabad in Gujarat. He completed his primary education and obtained the traditional priest education at Bhagavat Vidyapith, Sola, Ahmedabad. 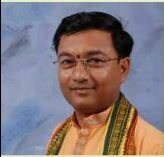 Shree Jayeshbhai Pandya has received Shukla Yajurved, Sanskrit and Karmakand education. Shree Pandyaji as Vedpathi pundit has performed many Pran Pratistha, Yagnas and coordinated big events like Bhagavat Saptah. Jayeshbhai has very good knowledge of Astrology (Jyotish Vidya), Vedik, Pauranic Karmakand and Shraadh Karma. He likes to entertain the devotees with his Bhajans and Kirtans during which he plays the dholak and tabla. He is conversant in Sanskrit, Hindi, Gujarati. Sri Seshasai Rompicharla is native of Andhrapradesh, India. He comes from a family of Temple Priests. His family members are hereditary priests to this day at Sri Kodanda Rama Swami Temple in Akulamannadu where they perform daily Pujas and services. Seshasai is son Ramanacharyulu and Grandson of Parthasarathi Bhattacharyulu. His grandfather was Asthana Pandit at Tirumala Tirupathi Devasthanam, who was honored by titles like “Sri Vaikhanasa Ratnakara and “Vidwat Kavi Sarvabhowma” by the President of India. Seshasaiji started this priesthood from 1995. He pursued training and study in the theory, practice, and methods of Hindu religious rituals and worship in Vaikhanasa Aagama. Seshasaiji can perform the Daivika Karyakramas ( related to gods ) like Archana, Abhishekam, Kalyanotsavam etc.. and Manushika Karyakramas ( related to Humans ) like Namakaranam, Annaprasana, Wedding etc.. according to Sri Vaikhanasa Aagama. He has an overall experience of 20+ years. He has ability to conduct daily rituals and special events in Hindu Temples and Hindu family residences. Very well experienced in performing special Alankarams to Deities. He is conversant in Telugu, Hindi, Marathi and English. Umamaheshwara Shivam was born and brought up in the city of Coimbatore, Tamilnadu, India. He has studied and received training at the Veda Patashalas at Kanchi Kamakoti Peetham in Kanchipuram. He received a scholar’s certificate for his Patashala education in ancient Veda-Dharma, Saivagama, Yajurveda and Jyothisha Sastra. He has become skilled in practicing the traditional form of astrology. His career includes performing of different Homams, (Havans) like Satha Chandi homam, and Sri Rudra Homam. 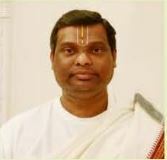 He has conducted Vivaha Utsavam, and Deva Prana Prathishtas in many Indian States. Maheswarji has participated in numerous Kumbabhishekam festivals in temples of Malaysia, conducting special rituals during Maha Kumbhabhishekam festivals. Maheswarji on many occasions has performed house Pujas and religious functions like Grahapravesam, Satyanarayana Puja, Wedding ceremonies, Upanayanam, Simantham, Namakaranam, Srardham, and Hiranya Srardham and so on. Maheswarji’s overall experience includes work in India, South-East Asian countries such as Malaysia & Singapore. He is fluent in languages such as Tamil, Sanskrit, Hindi and English.